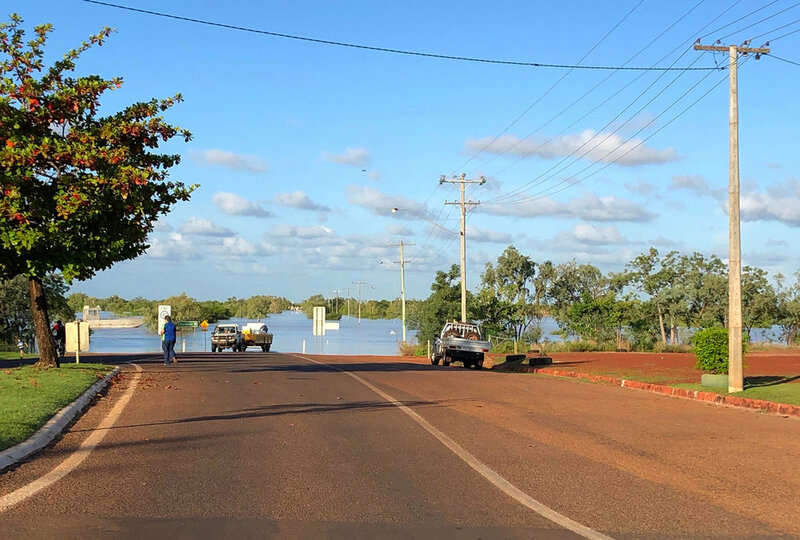 The recent rain event in north Queensland has made it’s presence felt in Normanton, the site of the recent sports facility built for Gulf CC. During the design process, a great deal of time was spent considering the appropriate level of the building slab in the instance of a significant rain event. Along with the level, consideration was given to finishes, wall construction, plumbing and structure to best weather the storm of the worst case scenario. Aesthetics are important, but the practical nature of design for environment was foremost in our minds when planning this building - from flood waters to wind driven rain; from extreme operating temperatures to dust ingress. A member of staff was able to capture these images of the rising waters. It was a great relieve for the design team to see the waters not encroaching into the facility, but stopping just shy. Our thoughts go to those not so fortunate and the people that are volunteering to assist them. We are very happy to announce that construction contracts have been signed for Stage 2.5 of Wisdom College. This project is the first step in a long term vision for the emerging campus. It has taken a lot of work to reach this point and we are all looking forward to seeing it completed and used by students in 2019. The project consists of 3x GLA classrooms, a store room and an external play structure. Design takes it form in many ways depending on the needs of the project. Sometimes it is all about the major planning arrangement of space and function, sometimes a project requires careful consideration of form/material and how they meet; then sometimes you have a project where the typology or budget limit the means to input expression that goes beyond the easiest/cheapest solution. Recent projects have led us to explore design consideration in all areas of the project, regardless of scale, material, function and budget. An example of this was the recent sports hall in Normanton. Functionally, the space required a robust steel portal frame - a building typology that that has been done thousands of times before in sheds across the country. How can we add ‘design’ to an already proven industrial model? The answer was to look at the steel detailing, and establish hierarchy. There are many architects who choose to highlight structural steel with colour, which we did in this case - but limited it to just the portal frames giving them visual significance over the other steel. The next move was to shift the plane of the purlin louvers to outside the line of the portal frame. This reinforced the importance of the portal, and creates the impression of a continuous external facade where one does not exist. Conwell Architects was approached by South Yarra Cricket Club to investigate opportunities to design a second sports stand to the Como Park facility. Como park has two ovals side by side and while one oval is serviced by a symmetrical brick clubhouse, the remaining oval means players and spectators are without protection from the elements. This second stand facilitates the seating and viewing of sports and events on the oval sufficient for two teams + spectators. The design looks to present a contemporary form that does not try to emulate the existing art-deco notes of the main clubhouse, but make reference to it via material and symmetry. The local municipal, The City of Stonnington, is currently reviewing the park’s masterplan. We hope the stand will feature in the planning of the park in order to service the people that enjoy it’s qualities every weekend.